Just installed my Woodcraft Clip-ons last night. 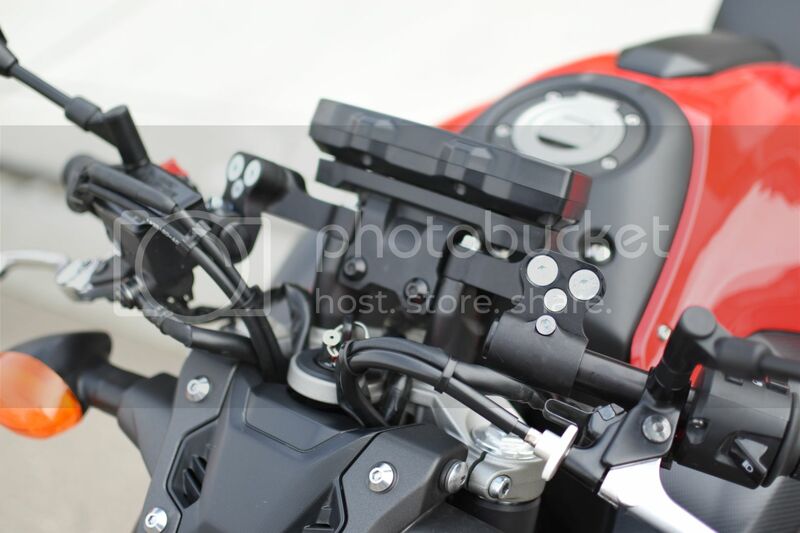 Had to wait on some parts (new steering mounting and OEM Yamaha R6 Throttle Tube), so that's why it took a while. First impression is, "I like this." I've only rode up and down the street, because I want to leave time for the grip glue and the threadlock to cure before I give it a shake down. You're definitely in a much more sportier forward position, and yes, you do feel awkward with the OEM Rear Sets. I will have more to say about that after I ride her more. 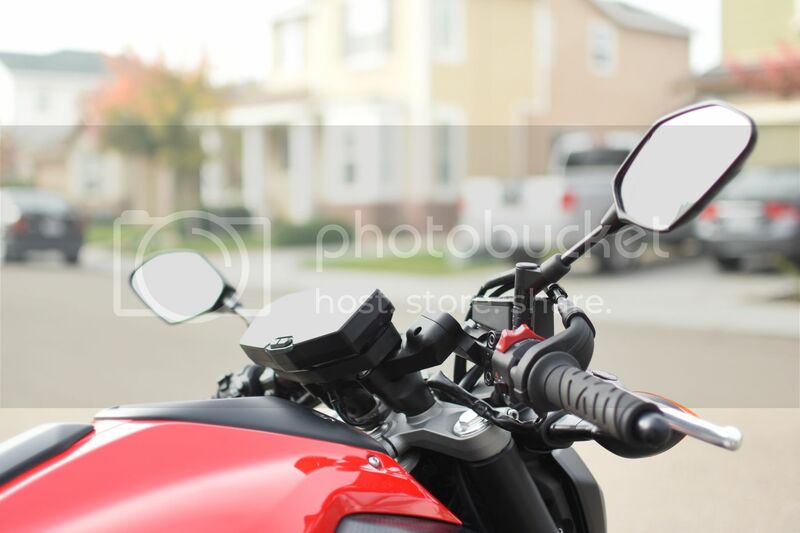 The look is just awesome, but my Givi windscreen is no longer usable with the bars in the down position. I have the 1.5" kit btw. 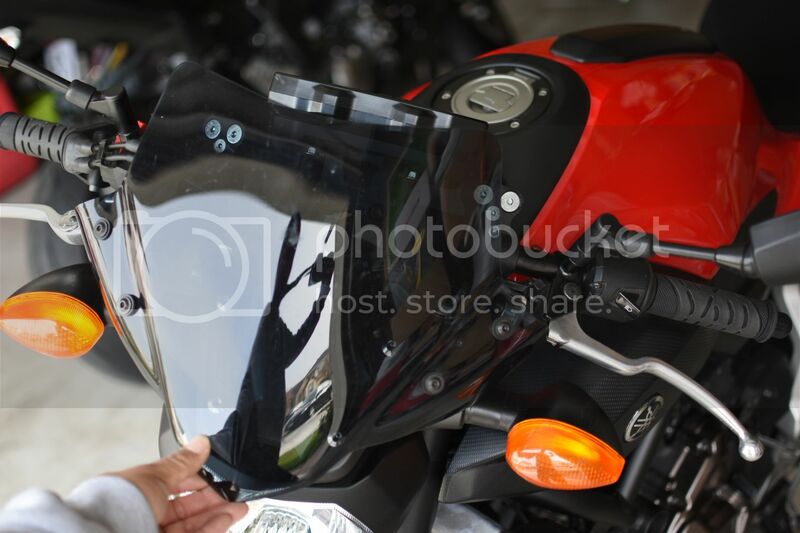 I will either look for another windscreen that's less wide, or custom some brackets to use the Givi. The bars down don't get anywhere close to touching the plastics, but it's close enough to pinch your thumbs at full lock (pinching occurs between the grip and the black air duct plastic). 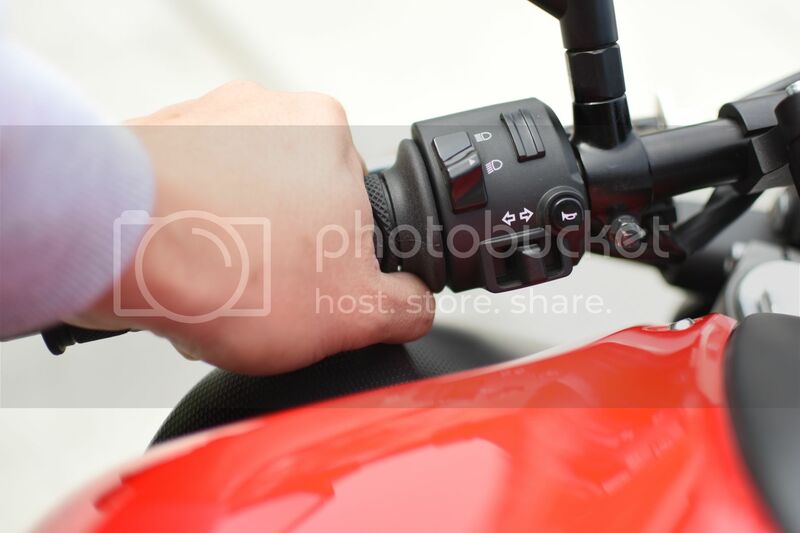 You just have to be mindful of your thumb position when backing up, so you don't accidentally hurt your "Like" symbols. I don't have anything bad to say about the kit at the moment. I'm extremely pleased with how it all turned out and the kit is just beautifully made. Everything feels sturdy and of high quality. I would say the install is not hard, but can be difficult for those who are afraid of trusting their own skills, because this kit requires you to drills holes for the controls, and setup the lever positions yourself. If you are capable, this mod is a no brainer for those wanting a more sportier feel. Something happened to the pictures. I can still see them in the thread. Your Internet laggy? I want rear sets and clip-ons.. Definitely on my top 3 list of upcoming mods along with LED headlight.. Other than that I'm running out of "bolt-on" mods and will have to start going further outside the box. 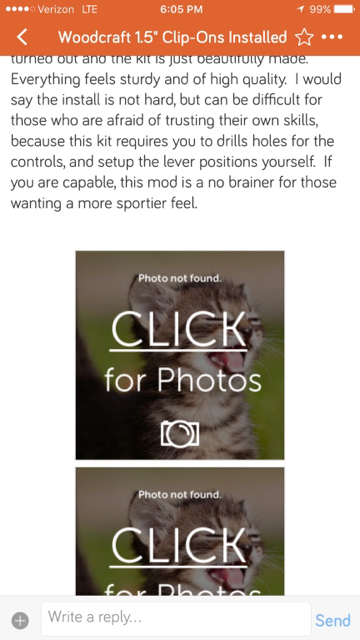 Nice pictures, please do update once you have more time to ride with the set-up. 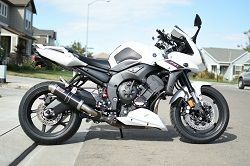 As im considering the same setup including the trottle tube and grips. 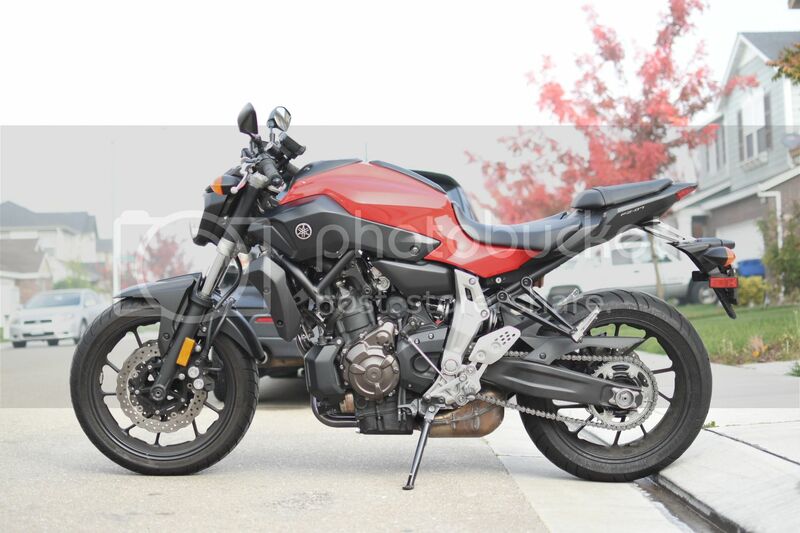 Its a shame for the givi. After 8000 miles arm/hand position doesn't seem to be a big of an issue for me (5'6") as I had originally thought. Having said that, I'd love to try out something like this. 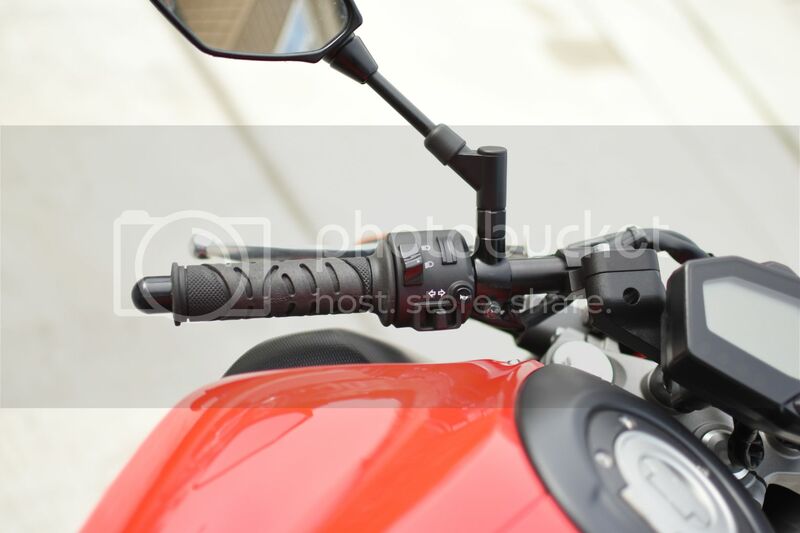 Good to know the Givi shield doesn't work with these clip ons, I was thinking about ordering that windshield to replace my OEM Flyscreen. I am seeing the photos just fine. That looks really nice. If I wanted a more aggressive riding position I think I would go this way. The way it mounts kind of turns me off to the woodcraft design. 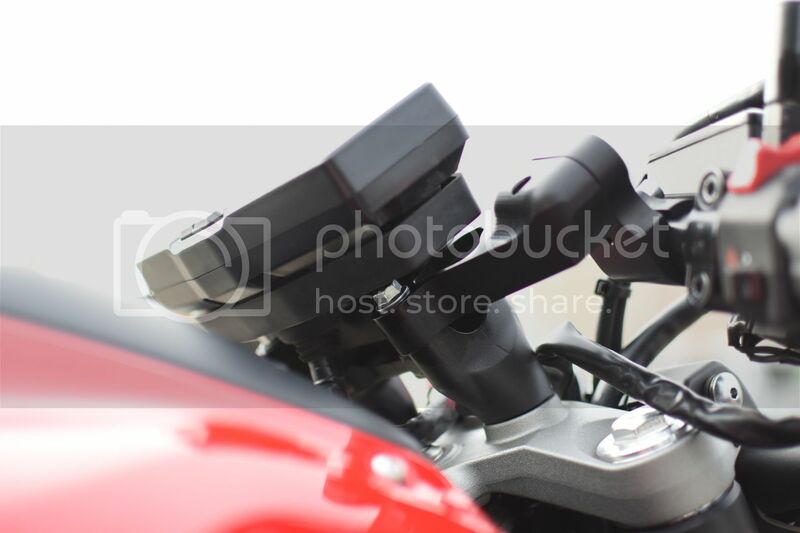 Or even just including a hardmount set of risers in the kit. Am i the only one? or does it just seem redundant? Looks sweet. What is the advantage of going with the woodcraft over a cheaper ($30-$40) non-adjustable bar? Is the woodcraft really worth it? Also, how far forward & down would you say these bars are compared to stock as you have them installed? e.g. 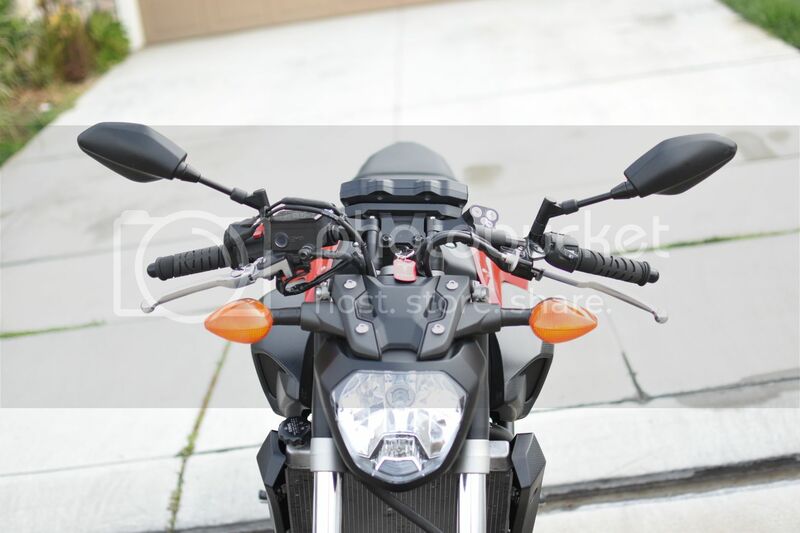 "they are about 2 inches farther forward and 1 inch down"
I'm definitely looking into making a sportier riding position as well, this bike is a little too upright for me. I have heard from a couple people that the stock rear-sets are a bit awkward with a more forward bar so I'm glad you confirmed that. I love the look of this setup, but wouldnt ownt it... The way it mounts kind of turns me off to the woodcraft design. 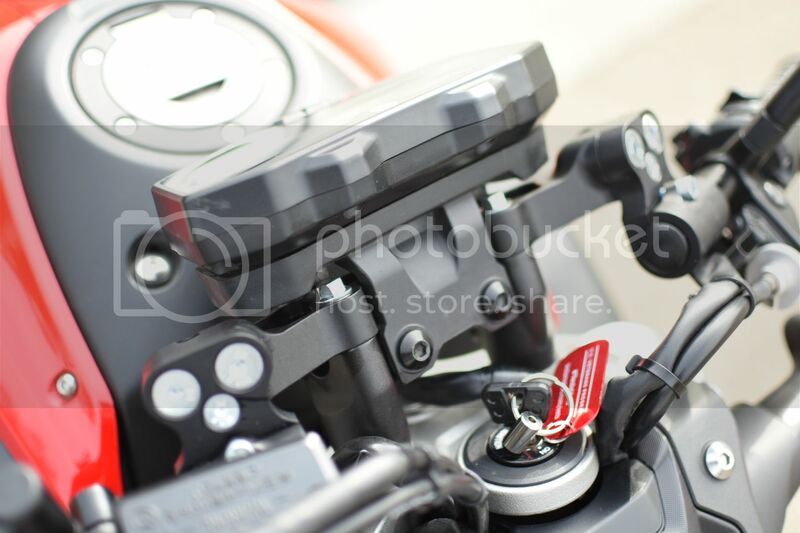 The OEM risers gives the mounting plate just the right angle for the clips ons to mount. Plus, it doesn't relocate the speedo (speedo mounts to the OEM risers). Less work for Woodcraft to engineer a mount. Just utilize what's there. I've only ridden with the clip-on set up for like 20 miles and I feel super comfortable. With the OEM bar, my right hand used to go numb on the freeway. In terms of worth, you'd have to be the judge of that. 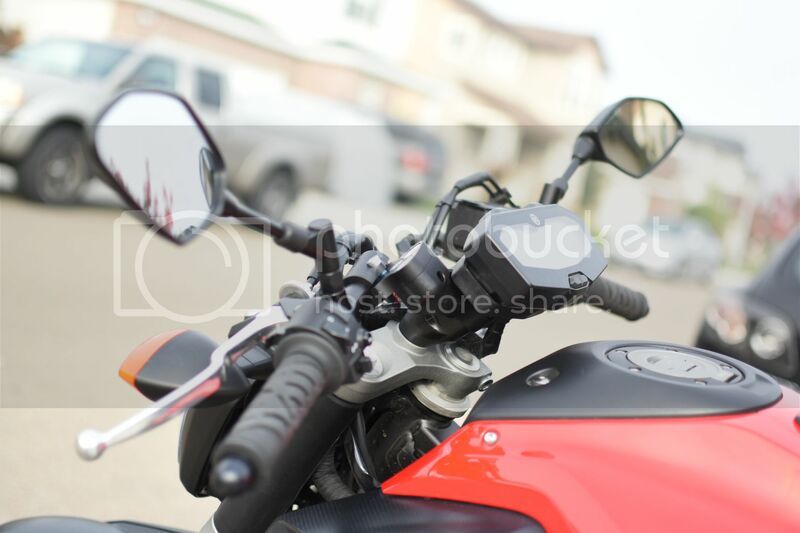 I laid the bike down after getting hit lane splitting, and I needed to replace the handle bar. I almost bought some Renthal Ultra Lows, but it wouldn't have been as aggressive. I feel it was worth it, because I now feel more "In control" if you will. My confidence has gone up a tick I think. 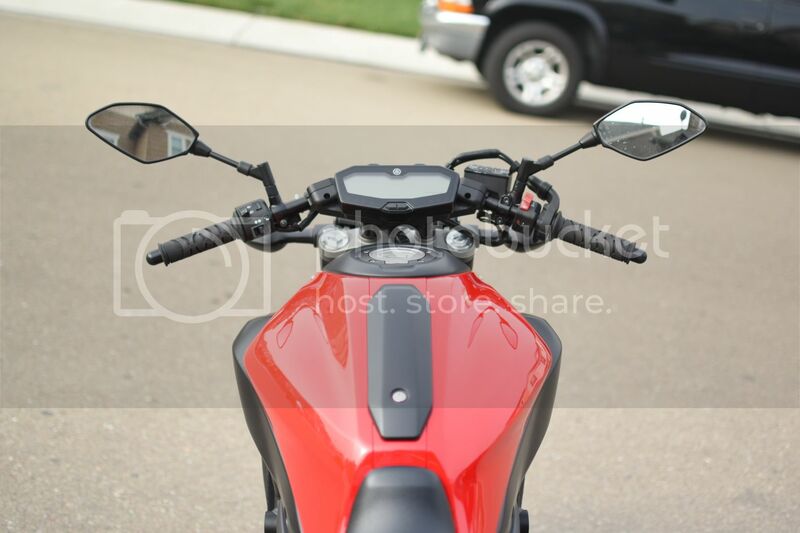 When looking at my bars compared to my brother 2015 Kawasaki Ninja 636, the sweep is very close to the same, but his bars are a tiny bit more forward. Just curious, how tall are you? Now that you mention it, lately the palms of my hands tend to get sore when riding. Have you got them in the up or down position? clip-on's is an illusion. Being tucked in is good for a racing posture and slipping the wind but that's about it. Anyways, I can't use them even if I wanted to, the standard factory bar put's enough crick in my neck/shoulder cramps after a couple hours of riding. They look great, buy some if you want! Thanks for the review. I'm going to buy them next month when I'm not riding anymore because i bent my original bars :/. How much are the rear set riser? Very nice mate Have you got them in the up or down position? They look good but any time you lower and shorten the width of your bars you have less control of them so feeling more "in control" with clip-on's is an illusion. Being tucked in is good for a racing posture and slipping the wind but that's about it. Anyways, I can't use them even if I wanted to, the standard factory bar put's enough crick in my neck/shoulder cramps after a couple hours of riding. They look great, buy some if you want! You're probably right Beemer, but I didn't like the stock bar. 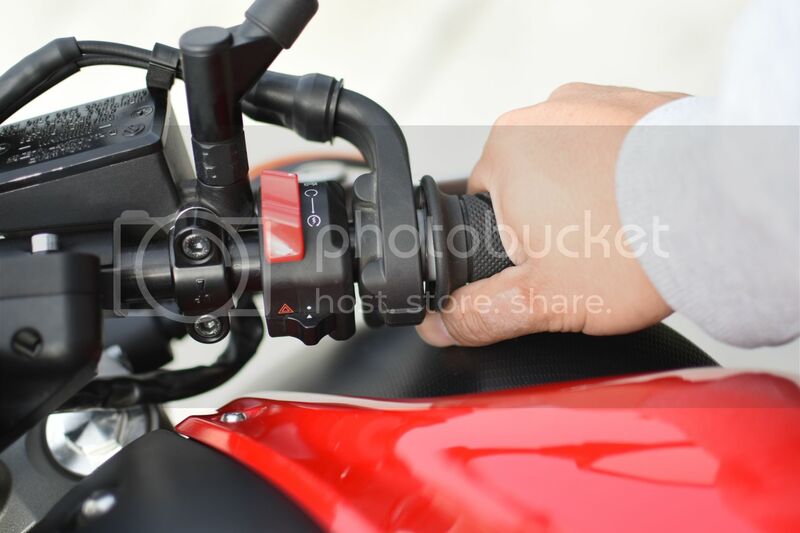 That is so weird, I also sometimes feel my right hand go to numb while riding on the freeway for a long period of time, I feel it less now a days since I added more air pressure in both of my tires, buy maybe I do need to order one of these for my bike, I like the look of the bike with the low handle bars. 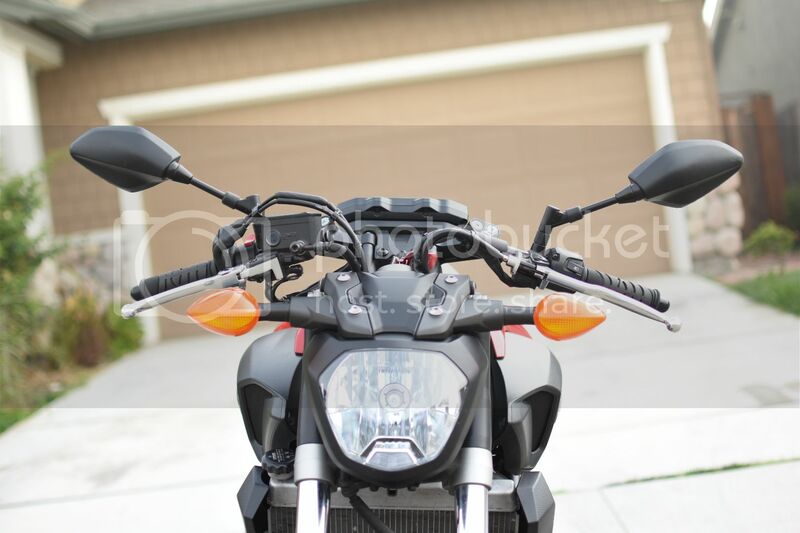 Does the kit give you the option to set it up for a different lower heights , I read on their web site a different lower handle bar heights , and I didn't understand it. can you please explain the different set up if their was any. You know, I've been researching rear sets and what I'm concerned with is replacement parts and of course adjustability and the value for the dollar. I really like the Gilles set, and even if I can afford them, they're harder to get and in the event of a crash, I don't know if there are replacement parts unless you buy another set. The Graves kit, I did't like the way they looked and I'm not sure about replacement parts, because I didn't look too deeply in that set. The Driven set looks pretty trick and does have replacement parts, is priced reasonably just over 400, but you would need to buy a new sensor for the Rear Brake light activation. 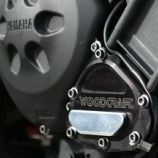 The Woodcraft set (which I may end up using) has replacement parts, is Sub 400 and does work with the OEM Rear Brake light activation spring. Then there's the LighTech sets that look amazing and are the most adjustable like the Gilles and Driven, but is the most expensive starting around $560. There's also Japanese branded stuff like "Over" and "Sato", but I don't see any value in going with those sets if you have quality USA made products where replacement is easily accessible and customer service is in a language you can communicate with. My 5 cents. 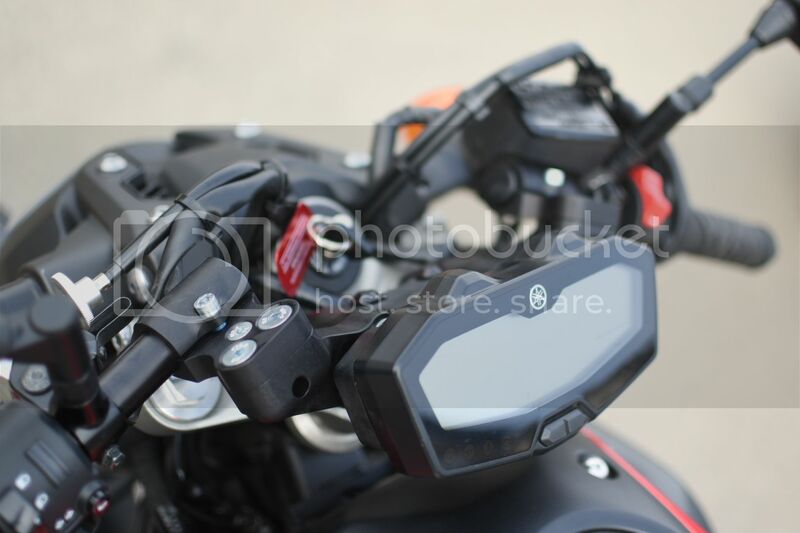 There's two kits available for the FZ07/MT07, the 1" & 1.5" riser/lower kits. The 1" is what I would call the "slightly different" kit, because in the up position it's slightly close to stock height, and in the down position it's slightly more agressive. In that same thought process, the 1.5" kit is closest to stock height in the up position, and is the most aggressive of the two kits in the down position. 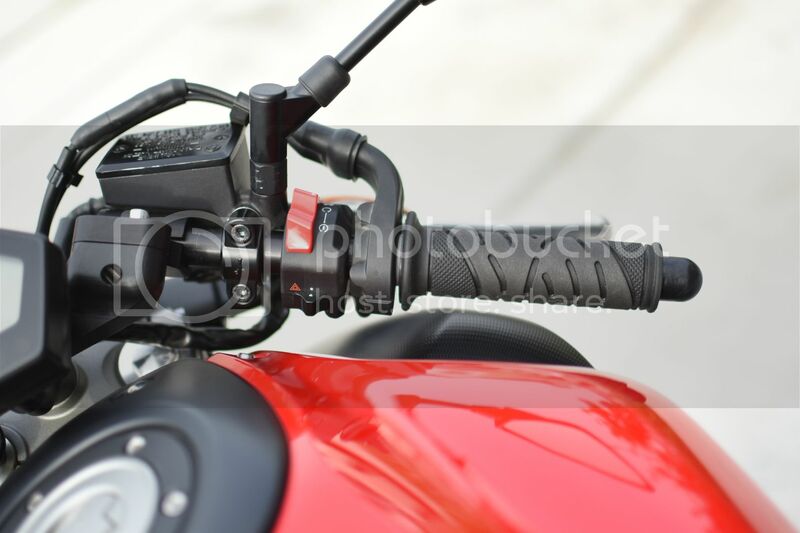 The Clip-ons themselves are nothing close to stock feeling as they change the sweep angle, but if you wanted the sweep angle but the minimal amount of forward reaching, they have 2" riser adapters, but those I believe can only be used in the up position, because in the down position, the bars will for sure hit your plastics. Hope that helps. jeffkisthename I understand that, I was just pointing that out but a person has to be comfortable ( I changed my seat) and that's not the same as how some people buy a perfectly good standard and spend a lot of extra money to try and turn the bike into what looks like a super sport that only gets passed on the road by every real super sport. That, I just don't get.